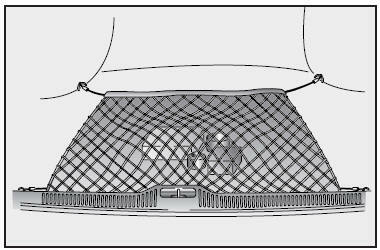 To keep items from shifting in the trunk, you can use the four rings located in the trunk to attach the cargo net. Do not put fragile, bulky or excessive items into cargo net. The items could be damaged. Avoid eye injury. DO NOT overstretch. ALWAYS keep face and body out of recoil path. DO NOT use when strap has visible signs of wear or damage.